If you want that certain code is available in all your workbooks, then use your PERSONAL.XLS or in Excel 2007-2016 your PERSONAL.XLSB file. This is a hidden workbook that opens when you start Excel. The code you copy in this workbook is available in all workbooks that are open in Excel. If it exists, you can find the file in the Excel startup folder. 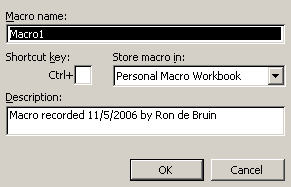 If it does not exist then record a dummy macro and change the "Store macro in:" drop down to Personal Macro Workbook. Excel creates the file for you then in the correct folder. Excel 97-2003: Tools>Macro…Record New Macro. Excel 2007-2016: On the “Developer” tab click on Record macro. In Excel 2010-2016 : File>Options..Customize Ribbon, check Developer in the Main Tabs list. Or faster click the button on the bottom left corner of the Excel 2007-2016 window to start the recording. Because we only want Excel to create the file for us we can stop the recording directly. In Excel 2007-2016 you can press the Stop Recording Button on the Developers tab or click the button on the bottom left corner of the Excel window to stop the recording. Excel 97-2003: Tools>Macro>Visual Basic Editor. Note: I use the name PERSONAL.XLS in the screenshots below but in Excel 2007-2016 the name is PERSONAL.XLSB. To be sure that we see the Project Window, Code window and the Properties window we use one time. Select the PERSONAL.XLS(b) in the project window and change the name in the properties window. We are now ready to add code (macros or/and functions) to this file so we can use it in all workbooks. With Insert>Module in the VBA editor you can also add more modules to the PERSONAL.XLS. This way you can organize your code in this file. Use only code here that you use yourself and not code that you use in files that you distribute to other users. In this case add the code in the modules of the workbook itself. Or distribute your VBA macros as a Add-in. MsgBox "Insert your favorite code here"
4) We copy/paste the example macro in this module. 5) Now use Ctrl-s or File>Save in the VBA editor to save the PERSONAL.XLS(b). 6) We use Alt–q to go back to Excel or use "File >Close and Return to Microsoft Excel". Note: You can delete the dummy macro that we used to create the PERSONAL.XLS(b). This custom function(UDF) gives you the ISO week number that is used in Europe and a lot of other countries. Note: In Excel 2010 and higher you can use the built-in WEEKNUM function(=WEEKNUM(C5,21), see the argument 21 that they add in Excel 2010. in Excel 2013 they finally add a new function named ISOWEEKNUM. 4) We copy/paste the example function in this module. When you open Excel and you see PERSONAL.XLS(B) in the title bar you can use this to hide it. Then close Excel and say Yes to save the changes to your PERSONAL file. When Excel think the file is corrupt it can disable the file. You can re-enable it here but if it is really corrupted replace it with a backup. You can also create an add-in to store code that you and others want to use in all workbooks. This is a good way if you want to distribute code to other users.